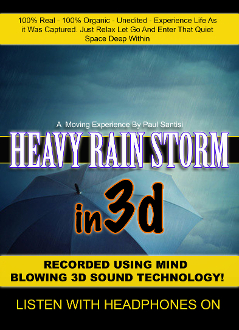 This audio REQUIRES Headphones to experience the Magical 3D effect. Enjoy this 100% organic un-edited sound of a heavy rain storm of the Boston area. Be submerged in 360 degrees of self awareness and mental clarity. Use this audio anytime - to reduce stress, anxiety and to feel amazingly clear and focused. This audio will have experience level of clarity and surrioundness that cannot be match. Truly an amazing creation of space.